Be sure to look at our News section for updates on community health concerns. Thank you for selecting Family Medical Group Northeast for your health care needs. Providing family medical care since 1985, our mission is to deliver high quality medical care available in a caring, compassionate, personable and welcoming environment. Our six providers specialize in complete health care for patients of all ages, newborns to seniors, and look forward to helping you attain the health care goals of both you and your family. We dedicate ourselves to achieving high standards of continuing medical education, utilizing cutting edge equipment, and recommending effective patient treatments and therapies. We also work hard to cultivate an atmosphere of effective and accessible communication between our staff and our patients, and we believe in the importance of patient centered informed care. Our providers value patient input and contributions, and encourage patients to play an active role in their health care plans. 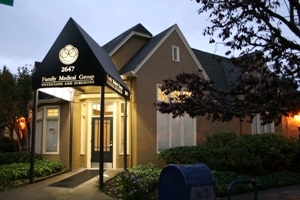 Our clinic recently became recognized as a Tier 4 Patient Centered Primary Care Home (PCPCH). This approach to health care includes the goals of a healthy population, extraordinary patient care for everyone, and reasonable health care costs. As a Patient Centered Primary Care Home we strive to achieve these goals by focusing on: wellness and prevention, coordination of care, and active management and support of individuals with special health care needs. We also promote a patient and family-centered approach to all of the aspects of patient care. Here at Family Medical Group Northeast we emphasize whole-person care in order to address each individual patient’s and each family’s physical and behavior health care needs. Our friendly and compassionate physicians and staff members want you to feel at home at Family Medical Group Northeast, and they work hard each day to promote a caring, comfortable, and professional atmosphere. We appreciate your trust, and look forward to helping you and your family with all of your health care needs! Family Medical Group Northeast is proud to announce our computer system and patient portal upgrade.